Cycle Count is the validation process or comparison between Paper quantity and Physical quantity. Paper quantity is the system quantity whereas Physical quantity is the actual quantity that sits in your warehouse facilities. There are four options or policies available to perform cycle count activities. As you can see “Cycle Count Details” are divided into two groups, i.e. “Original Items” & “Verify Items”. 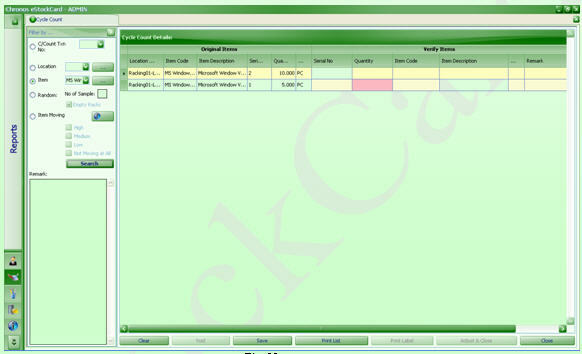 Original Items consists of information that is recorded in the system for the past operations. Verify Items are the fields need to be filled up during actual cycle count if there is any discrepancy from Original Items is encountered. You can print it out by clicking “Print List”. Use this hard copy as reference during cycle count (Fig. 4). Click “Clear” to issue additional request for different item code. Otherwise, click “Close” to exit from the Cycle Count main screen. Step 1 After cycle count is performed and you have found that one copy of “MS Windows Vista Business” from the location code = Racking01-L1-C1 is lost. The actual quantity = 4 instead of 5. You must report to the system now. This process is called “Adjustment”. 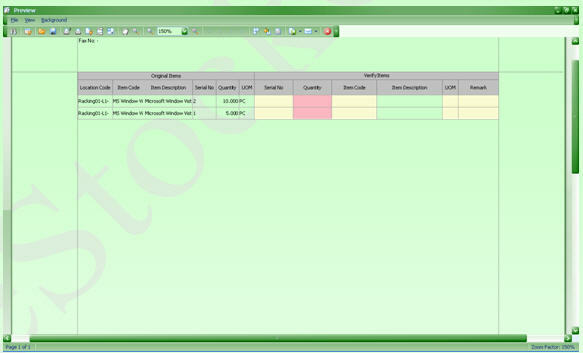 Step 2 Click “Inventory > Cycle Count”. 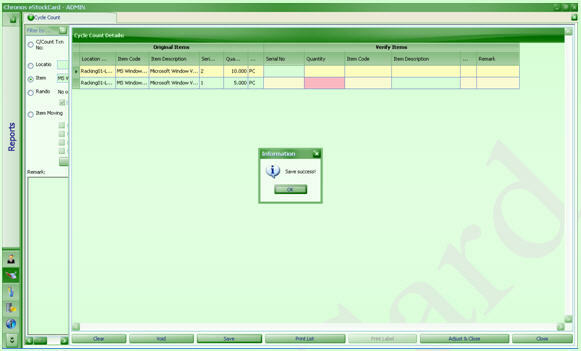 Step 3 Select “1” from “C/Count Txn” drop down (alternatively you can select “MS Windows Vista Business from item code drop down) and click “Search”. This is to recall your previous records. Step 4 Select the appropriate row with location code = Racking01-L1-C1. Enter the QTY = 4. All remaining fields remain blank since there is NO discrepancy. (You only need to enter what is NOT tally). Click “Adjust”. NO reverse process or void can be performed if the status is changed (adjusted). Inventory figures will be reflected accordingly if adjustment has been performed. Step 5 Click “Close” to exit from Cycle Count main screen. You can validate whether the adjustment is performed successfully by many approaches.